Sidon (pronouced Saidoon) is an ancient Phoenician city about 48 kilometers outside Beirut, Lebanon. It has an illustrious history beginning very early in the sea trade in the 12th - 10th centuries BC. Henry and I think he is a remarkable stallion and deserves a name that suits his character. This year we are concentrating on under saddle work, the goal is to get out to show in Working Equitation. Personally, I am hoping to ride him myself. He has the best denmeanor ever. Love this boy. Its been an exciting first half of the year with Sidon going to Trevor Miller and Arlene Padilla to stand at their farm and be bred to the Zee King daughters. He and Trevor have quite a lovely friendship and after their showing in California Trevor will now put him under saddle. 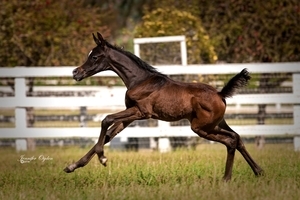 This is the son of Ali Saroukh that Henry and I have chosen to become his sires' legacy at SMF. He is intensely linebred because his dam, Shaboura is out of Ali Saroukh's full sister, Sahbine. We were encouraged to try this pairing of family members by Bazy Tankersly, of Al Marah Arabian fame. We were honored to have Bazy visit our farm and while there she especially liked the Glorietasayonaara family. She encouraged us to inbreed in order to set those physical traits that we love in this family. The only lines different in this pedigree are the ones extending from PVA Kariim, a charismatic and ethereal Imperial Imdal son out of BKA Rakiisah (Theegyptian Prince x AK Radia by Ibn Moniet El Nefous). All the physical traits of the horses in this pedigree are quite similar; they are tall with a great lenth of neck, long legs, movement that is floating and powerful. 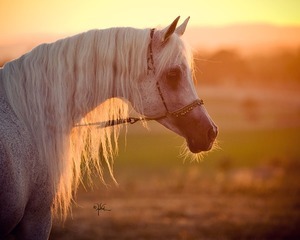 The bonus is that also have a charisma that is magical, they make your heart pound when you see them come charging into an arena or just playing in a pasture. Their necks are set high and there is an amazing length of poll that lends itself to their overall carriage or wearing a bridle. There is a heavy blending of Saqlawi to the Dahman but some Hadban families and Kuhaylan woven in as well. 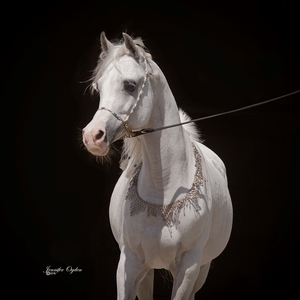 This creates a beautiful tapestry of many diverse blood lines and amazing horses. Typically, you might see bays and predominately greys with a few chestnuts or even black mixed in, but all have a similar phenotype which is not always the case when horses are of different colors even though the same blood lines. Sidon is taking forever to become white, much like his sire but in actuality both of these families are ones that require patience for them to reach their maturity and apex of beauty,... with many interesting stages along the way. Sidon is one of my favorites because he is so incredibly gentle but when it is time to show off he loves that too. Sidon SMF from Darryl Larson on Vimeo.